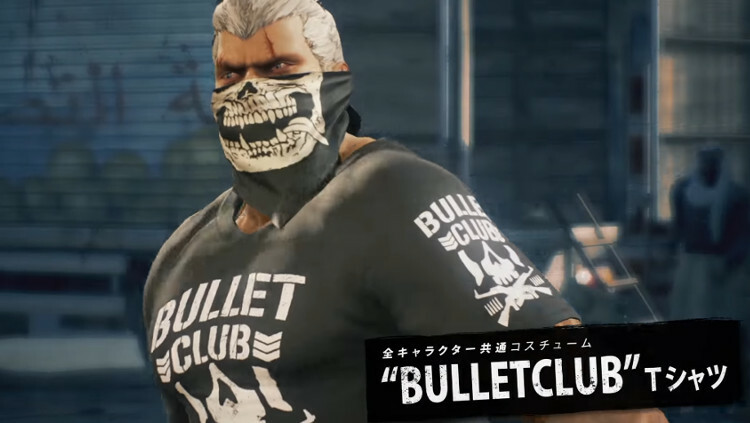 Tekken 7 now features alternate costumes based upon one of the most popular professional wrestling stables in the world, with Jack and Bryan Fury being depicted wearing Bullet Club attire in the latest trailer for the game. The Bullet Club is a legendary pro wrestling faction that has appeared in the Japanese grappling promotion NJPW and the US-based ROH, with its members having previously included current WWE Superstars AJ Styles, Finn Balor, Doc Gallows and Karl Anderson. A cross-promotion between NJPW and publisher Bandai Namco Entertainment will mean that Tekken 7‘s combatants can now wear clothing adorned with the familiar Bullet Club logo, following on from Bandai’s previous announcement that the masked combatant King will wear an outfit based upon the wrestling promotion’s heavyweight champion, Kazuchika Okada. King can also use Okada’s legendary finishing move, with ‘The Rainmaker’ making its way into the fighting game this year. Tekken 7 will also feature other references to NJPW, with players able to equip attire featuring the Chaos stable’s logo, a faction which was previously spearheaded by current WWE NXT Heavyweight Champion Shinsuke Nakamura. NJPW are also set to promote the game during one of its largest events of the year, with Okada set to wear King’s new attire during the company’s upcoming Fantastica Mania event.